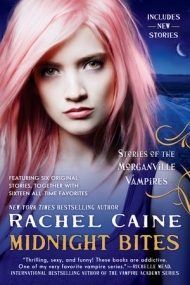 Rachel Caine is an amazing storyteller with her Morganville Vampire series. I love her characters including the town where Vamps and humans live side by side in a Texan town. This series is totally addictive! I loved it when Morganville: The Series was available online. Now Caine has compiled some of her short stories, including six original stories in an anthology which is a must have for any fan! NEW BLOOD where I get to see the world before the Lot house and a Collins family disaster. Oh, and the idea of a Bloodmobile is really kind of creepy and ironic considering Morganville is home to vampires. THE FIRST DAY OF THE REST OF YOUR LIFE shows readers Eve's eighteen birthday and how she now has the decision to either sign the Vampire Protection agreement and fit in with the rest of the Morganville residents or not. SIGNS AND MIRACLES is a mystery story that shows Hannah as an detective and also shows more of the Morganville Police Department. There's more short stories that show some backstory of the characters along with new tales too. Great collection of short stories that features six original stories which is perfect for Morganville fans and also for those just starting the series. 2. Features six original stories!